It is the year 2019, over the last two decades a long hidden subspecies of human has emerged: Homo-Superior: Mutants. These individuals are by all means human, but for a single, major difference: an X-gene that gifts them with abilities that range from the mundane, to the extraordinary. Frightened by the prospect of losing their place in the world to this new breed, humans and their respective governments have been quick to respond with anger and hostility towards this ever growing and, (mostly), peaceful group of individuals. Not helping matters are the increasingly violent demonstrations by the Mutant rights organization known as The Brotherhood whose number of supporters swell by the day. 1. I am the GM, please run any potentially game changing plots, ideas, or powers by me. 4. Keep more explicit ERP to PMs. This is a Role Play taking place in the beginning years of the X-Men. As such I would prefer using characters from the first run of the comics, (The X-Men Issues 1-66), with room for a few variations and OC's but preferably not many. I do have a few characters I would like to see as well as a few I would prefer not to until later in the roleplay. I will list both below. Calm and gentle, Xavier doesn't approve of violence and seeks to solve any potential conflict by mediation as opposed to force. A mostly reserved man, Charles only speaks when he truly wishes to be heard, giving him a stoic and commanding presence. He is also a charming and charismatic man, well versed in etiquette and manners. Born to a wealthy family in Westchester, New York, Charles Francis Xavier's powers manifested at a young age, though he never told anyone. As a child and adolescent he displayed an extremely advanced intellect for his age. Using his natural intelligence, (bolstered by his telepathic abilities), Charles earned his first PhD in Genetics from Oxford University at the age of 18. After earning several more degrees in various subjects, Charles was drafted by the US Army for service in the Gulf War. It was there that he met an individual who would become potentially the most important person in Charles' life: Erik Lensherr. Erik, (who at the time was going by the surname Magnus), and Charles quickly became friends due to their many shared interests, including the subject of genetic mutation. Charles revealed his abilities to Erik and to the happy surprise of Charles, Erik revealed that he was also a mutant with the control of the electromagnetic spectrum. After their exit from the military, the duo elected not to part ways. Instead they shared many adventures together while seeking out other individuals like them. Unfortunately like all good things, this happy time came to an end. Whilst on the trail of a cache of stolen Jewish gold, (which belonged to Erik's grandparents who were killed in the Holocaust), Erik and Charles fought Nazi Baron von Strucker, and his Hydra agents, Erik attempted to kill von Strucker, for his crimes against his people as well as his experiments on mutants but Xavier stopped him. A struggle ensued and Charles was accidentally shot in the abdomen, paralyzing him from the waist down. Erik rushed his good friend to a hospital, leaving Strucker and his agents but taking the gold. As Xavier was recovering, Erik and Charles had many a serious conversation about the future of mutants. Realizing that his and Xavier's views on mutant-human relations were incompatible, Erik parted ways with his friend. 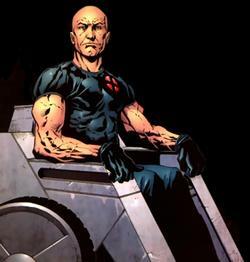 After that fateful day in Germany and confined to a wheelchair, Charles began traveling the world lecturing at Universities and giving council to world leaders on Mutants and thier place in the world. Despite hoping for the best Charles was well aware of the hostility towards Mutants. Sensing the coming turmoil, Charles has begun the process of creating a school for mutants as a place of shelter, but also as a school to educate these extraordinary individuals on how to traverse through the difficult situations they may find themselves in. Above all, Charles hopes to instill the idea that Humans and Mutants can peacefully coexist despite the attitude of the times. Charles is one of the most powerful telepaths in the world. Capable not only of reading other's thoughts and influencing them, but utterly dominating their mental capacity. Fortunately for the world, Charles is a peaceful man, and only uses his powers to their full potential on extremely rare occasions. Other: Expert chess player, enjoys Earl Grey Tea. Appearance: A pale woman, with dark red hair, and deep brown eyes. She wears a pair of black leather pants, a kind of leather chestplate, and a red leather coat. Bio: Scarlet Witch and Quicksilver to be the unknown offspring of supervillain Magneto. Born to Magneto's estranged wife in Transia, Scarlet Witch and her brother are left in the care of their adoptive Romani parents and she was raised as Wanda Maximoff. When she came of age, she left with her brother, trying to find her father and the source of her powers. She found neither. She still looks, but less urgently. Personality: Wanda is deeply emotional, and hates to see things in pain. Though she despises that, if you cross her, you're done for. She is also curious, and loyal almost to a fault. Last edited by Jason Todd; 02-27-2019 at 02:30 PM. Last edited by SaltyIrishman; 02-26-2019 at 12:26 PM. Hey Jason Todd, this looks like a SUPER RP you've got here. If you'd like to advertise it, please allow me to show you some ways to do so. First things first, you should check out Roleplay Of The Week, which you'll be able to see advertised on the forum sidebar, and on the sites home page. If you go through and submit your RP for Roleplay of the Week, and it gets chosen, it will show up on the site, allowing people to see your awesome RP! If you do decide to submit your RP for Roleplay of the Week, you'll need a Banner for your submission. If you're unable to make one yourself, head on over to the Banner Shop and one of our awesome artists will help you out! If you don't want to make a submission for Roleplay of the Week, post in the Roleplaying Games Directory and people will be able to find your RP there! Finally, if you post here, members of staff will put a link to your RP in their signature to help people see it. Thank you for your application Salty! I'm very glad to have someone show interest this early! If you wouldn't mind, I'd like you to make a few minor changes to your CS before I officially accept it. Firstly, please include either a written appearance, or an image to show what you would like to have your character look like. Secondly, (and this is my fault), please write a personality description for your character, just to let me and others know what demeanor you want Wanda to have. I apologize as I had forgotten to include that in the CS. Lastly, if you wouldn't mind expanding on the Bio a little, just to expand on your version of Wanda's history. As soon as you get those minor changes made, I'll put you in accepted characters! Welcome aboard in advance! Last edited by Jason Todd; 02-26-2019 at 01:56 AM. Great! I'll put her in the accepted characters. I'm currently working on getting a banner to advertise the roleplay. Once we get about 4 more people we can get started! Last edited by Jason Todd; 02-26-2019 at 09:04 PM. If you know of anyone who you think would enjoy being a part of this roleplay, please direct them here! I've advertised on the Roleplay Directory and I'm waiting to hear back on an official banner so I can post in Roleplay of the Week. Okay. I might know a few. Awesome! I sent a PM to a Moderator to try and get it on RP of the Week, I suppose now we just wait. Last edited by Jason Todd; 02-27-2019 at 04:26 PM.